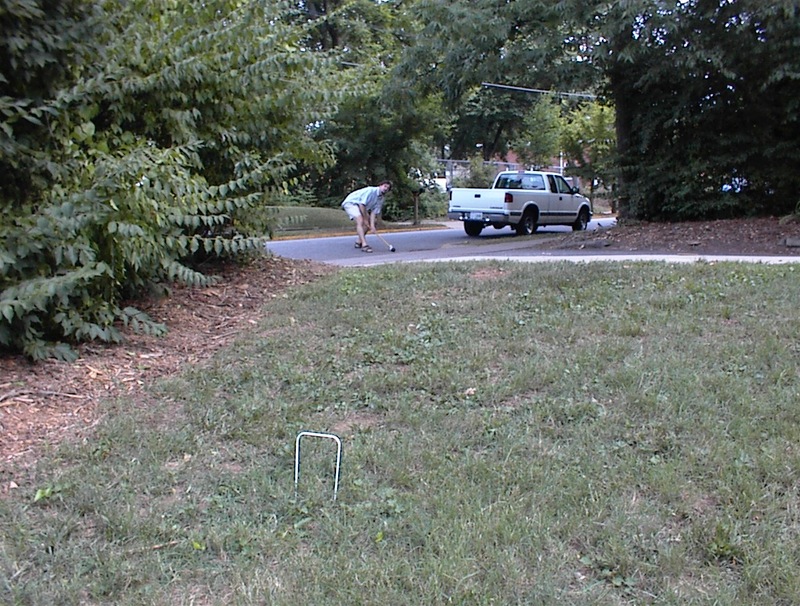 This weekend, I introduced many people to the joys of croquet. And I got introduced to a kindred spirit, though that’s a subject for another time. My cast and crew and I capped off six hours of set construction with a cookout party at the theater. 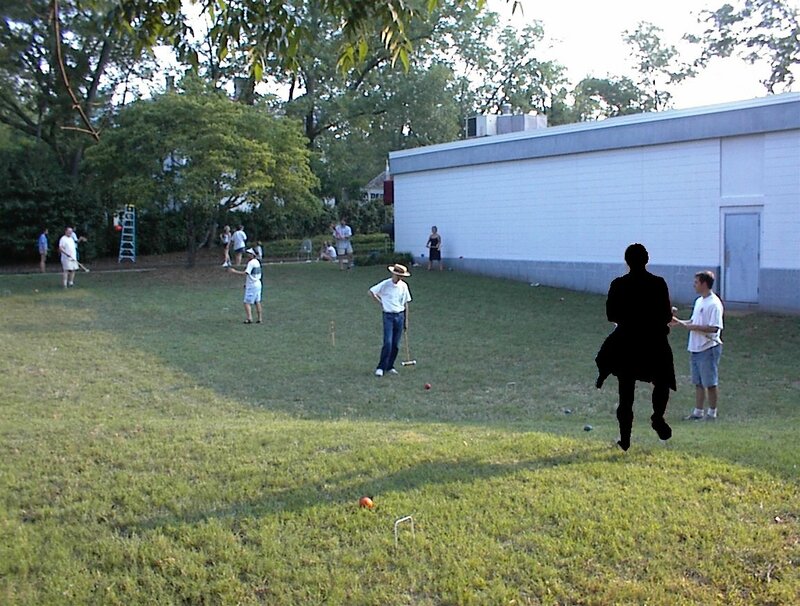 A good time was had by all, but the best time was had by those who played croquet. That’s just how it works, you know. My fabulous friend Steve took pictures, and I’ve put the highlights here, if you want to look. They’re high quality (meaning large — 400 kb or so). The first game clearly emphasized knocking balls around the course more than hurrying through the wickets. I got sent into the street early on, putting me on the bad side of a curb. Nothing a little improvised ramp couldn’t solve, though it still took four shots, and I ended up in the street a few shots later. The back of the theater had a big bed of rocks that was a deathtrap to any balls sent there. Of course, they tried to send me there when they got the chance. It didn’t work, and paybacks were had. One of the most enjoyable aspects of the game was the cute hazard on the course. 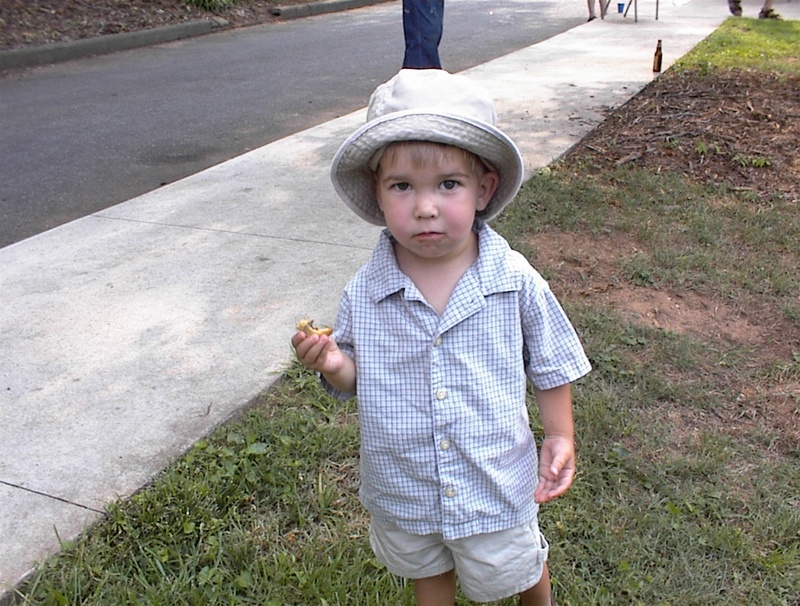 This little fellow, seen here emulating Dad, liked to chase balls around the course. He was particularly fond of his dad’s ball, and when one of us would hit it, before we could send it where we wanted, the little fellow would pick it up and go give it to Dad. Very protective, he was. 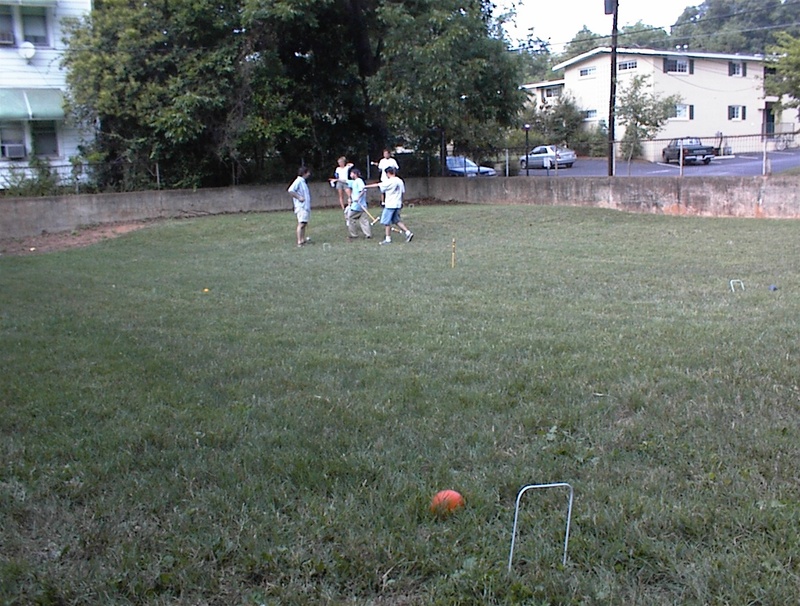 Partway through the second game, the croquet pitch was shared with a wiffleball game. That added to the fun, of course. In this photo, wittily titled “The Pitch” (You see, it shows not only the croquet course, sometimes called a pitch, but also someone throwing a wiffleball at a batter, also called … I know, it’s a stretch at a witticism, but then, that’s me all over. 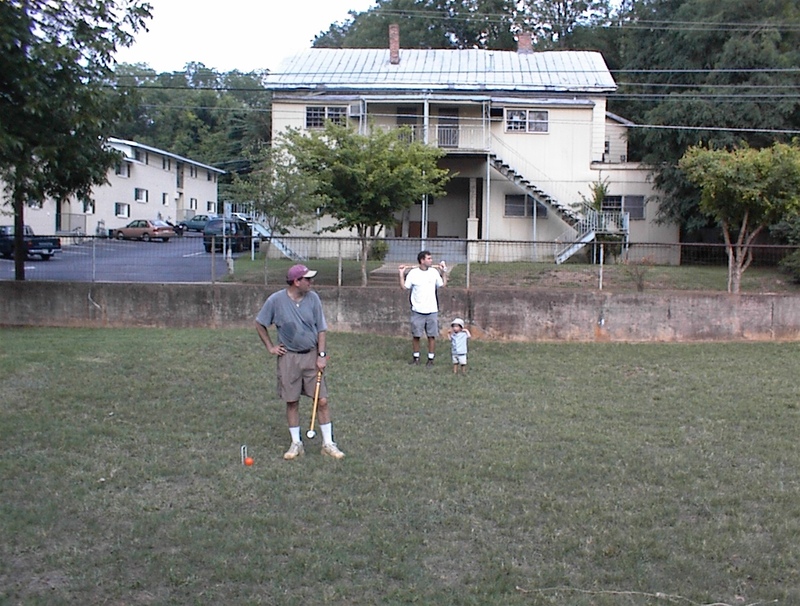 ), you can see me preparing to swing wildly at the big red wiffleball. 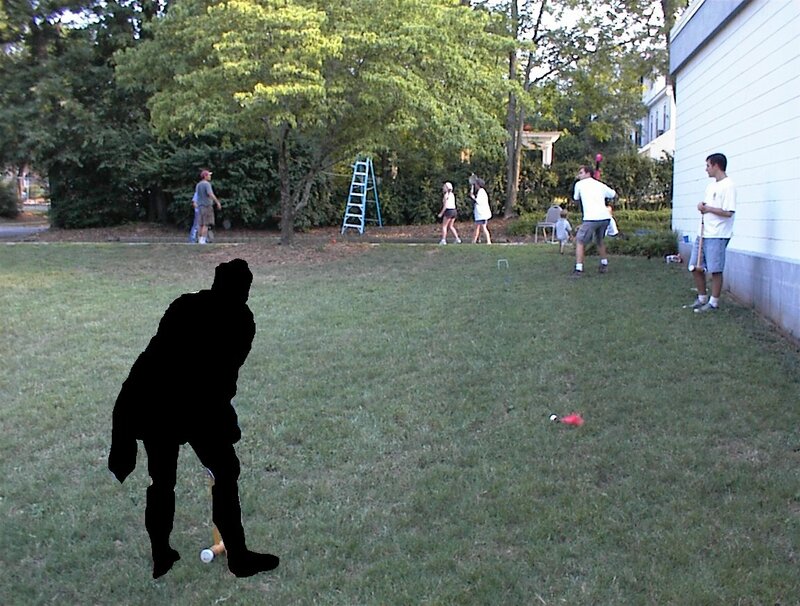 That’s my newly-met kindred spirit standing near me, trying to avoid the wiffleball. A few seconds later, I hit her on the ear with a mighty foul anyway. Just call me Mr. Good First Impression. It was a fine Saturday evening all around, and a great way to relieve the stress that had been rapidly building. There’s a cheesemakers’ web ring. There’s a cheesemakers’ web ring. I should have guessed. There’s 21 sites listed, ranging from professionals to people like me. Concangis is the Roman name for Chester-le-Street, a place in County Durham, Great Britain. It was excavated in 1990-1991, and the excavation is completely documented on-line. This is the most complete documentation I’ve seen on an archaeological excavation and is of interest to academics and lay persons alike. It brings together popular accounts of the dig, academic papers, photos, and even the daily journal of the person in charge. One artifact found was a portion of a cheese press. Leener’s Brew Works is your Do-It-At-Home Store specializing in food and beverage homecraft. Their list of supplies and books seems exhaustive, and I’ve only just begun poking around.